I started with the version I called «Old-style». That’s an adaptation I made from several old cocktail books such as Harry Johnson’s «New And Improved Bartenders’ Manual». My recipe calls for equal parts of rye whiskey and sweet vermouth and dashes of bitters and maraschino. 2 dash aromatic bitters (Angostura). Stir with ice and serve in cocktail glass. 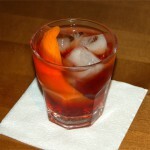 Garnish with maraschino cherry (I used brandy-soaked cherry). The nose is mostly winy with light spiciness on the background. 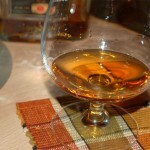 Silky mouthfeel comes before winy start, and on the swallow whiskey begins to take a lead in the taste. 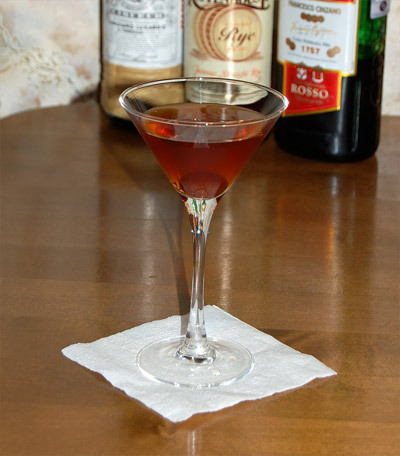 In the aftertaste cherry and spices combines with vermouth on the nice background of wood, herbs and grape seeds. Sweet cocktail based mostly on the Cinzano bouquet. Whiskey stays behind vermouth adding its delicate wood and spice notes. The next Manhattan I made with bourbon whiskey, and I think that’s commonly used version while bourbon whiskey is available widely as opposed to rye whiskey. 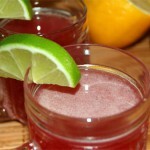 1 healthy dash aromatic bitters (Angostura). 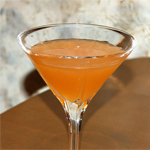 The cocktail starts with typical spice and fruit flavor. Basil Hayden’s bourbon whiskey confidently controls vermouth so here bourbon is a leader not Cinzano. In the start wood meets herbs and wine. They creates clear and a little dry taste which develops in a great combination of spices, oak and sweet red wine with delicious grape and earthen undertones. Later it turns to full-bodied finish of dried fruits, bitter seeds and warm spices. 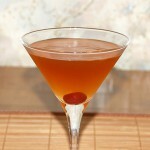 Definitely that’s richer Manhattan with great body provided by Basil Hayden’s bourbon whiskey. Not better than my first Manhattan with rye whiskey but just a smooth rich cocktail successfully balancing between sweet and dry sides. 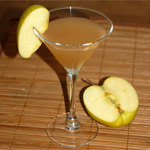 The third cocktail is not Manhattan. That’s true, it inherits Manhattan formula but its aroma profile is far from typical Manhattan. 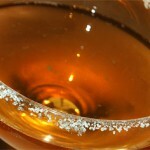 It because I used here my «Tea and spice» aperitif based on dry rose wine, black tea and Indian spices. That’s why I called it Ceylon Manhattan although I think I’m wrong: that’s too spicy for Manhattan, and people at Sri Lanka do not drink Manhattan cocktails, don’t they? 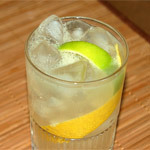 2 dash orange bitters (Angostura). Stir with ice and serve in cocktail glass. 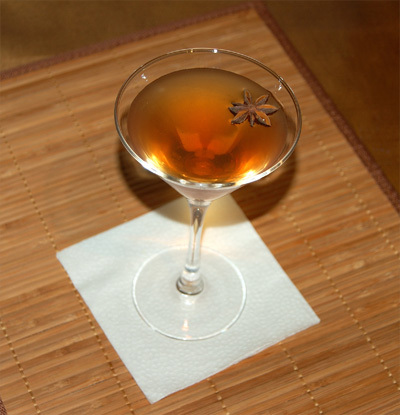 Garnish with star anise pod. 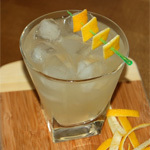 Or use orange twist as a garnish. The sip is dry and wooden with nice wine background. On the swallow I found a lot of strong black tea, anise and cloves hints as well as charcoal and dried orange peels. Finish was exceptionally long, dry, with tea and berries undertones. Surprisingly harmonious and very warm composition with whiskey perfectly integrated in the aperitif aroma. Not the cocktail you would enjoy every day but nice choice for frosty winter evening.